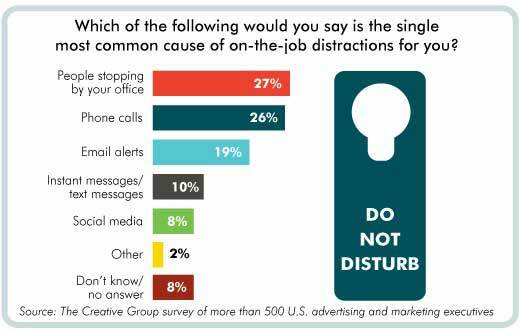 Dealing with on-the-job distractions is a constant part of every marketing professional's day, according to a new survey by The Creative Group. Ad and marketing executives surveyed say the longest they can work on a task without being interrupted is 30 minutes, on average, the according to the study. The most common culprits of on-the-job distractions are people stopping by to chat and phone calls, cited by 27% and 26% of ad and marketing execs, respectively.